WATERTOWN – It all starts with the title. “Fat Pig” is a smack to the face, a punch to the gut, a strong signal about what playwright Neil LaBute has in store for you in the next 105 minutes. And the surety that it will not be a comfortable evening of theater. The Flat Earth Theatre is presenting “Fat Pig” at the Mosesian Center for the Arts through June 24. The work is not often done locally – the only other local production I can recall was at Speakeasy Stage in 2007 – perhaps because of the material itself and the requirement that Helen be a skilled actress who is willing to put herself front and center in a difficult role. LaBute wants to upset you, put you in the shoes of his characters and ultimately put you to the test and ask: What would you do in the same situation?. Lindsay Eagle, who plays Helen, has been one of the guiding lights of the award-winning Flat Earth troupe, which often overcomes modest budgets with imagination and enthusiasm, and has been steadfast in providing more theatrical opportunities for women. 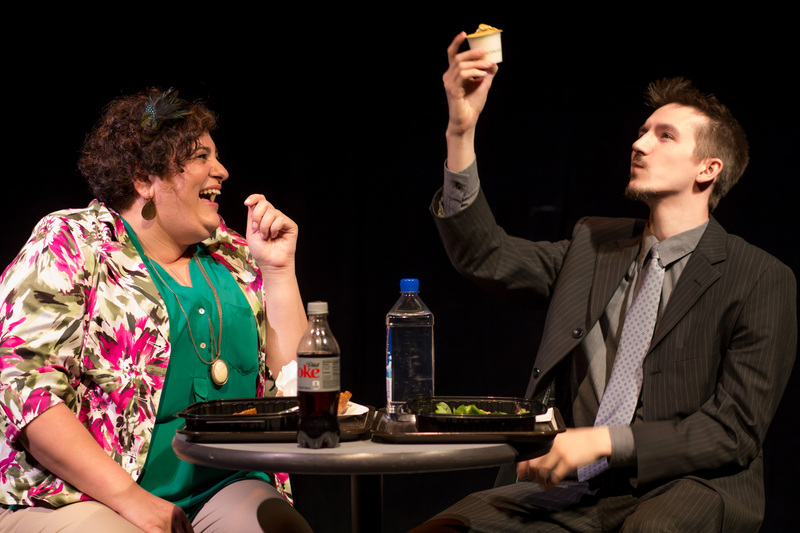 As “Fat Pig” opens, Helen, a librarian who happens to be overweight, is sitting enjoying a good-sized lunch, and with the room crowded, Tom (Jordan Lindley) asks if he can join her. Tom is enjoying a modest salad, Helen something more substantial and they both have a laugh at the stereotypes of what society says they should be eating. The two enjoy lunch and more laughs and Helen’s ‘s humor, possibly combined with her interest in war movies, lights a spark that leads to a date. But even after a time and date are set and a phone number obtained, Helen, obviously wounded in the past, comes back to the table and tells Tom that even if he doesn’t follow through on the date, she is happy to have met him. Dustin Teuber is Tom’s work colleague and friend Carter. He is cynical and snarky, with a take-no-prisoners type of of what might tenuously be called a sense of humor. Teuber lays it a bit too thick at the beginning before settling down and finding a more comfortable area for his character to work in. He is a “friend” – but early on, we’re wondering just what he and Tom have in common and what the “friendship” is really about. Jeannie (Kristen Heider) is Tom’s off-and-on girlfriend who works in accounting, attractive but insecure and anxious to define her status with Tom. When word “leaks out” there is another woman in the picture the insecurity bubbles to the surface. When it turns out to be a plus-size woman, anger and hostility ensue. LaBute has some fun with stereotypes and is not above using them to flummox his characters. Helen’s self-deprecating sense of humor – fat people are supposed to be jolly, don’t cha know, she reminds us – provides openings, as does Tom’s easy-going nature, not to mention the occasional viciousness of Carter and Jeannie. What’s beneath the surface? Not all overweight people are smart, funny and caring as Helen is and Jeannie’s attractiveness may just mask some very unflattering character traits. The Helen-Tom relationship evolves and becomes physical as well as emotional, but is Tom “hiding” Helen from his friends and family? And Carter and Jeannie, while outwardly being supportive – as Carter moves in on Jeannie – start to drop not-so-subtle hints that dating Helen may undermine both’s Tom social status and his career path. The last few minutes of “Fat Pig” are excruciating to watch. Few relationships of any kind could withstand the kind of outside scrutiny Tom and Helen undergo. Will Tom’s “I’m not good enough for you” line serve as an escape hatch, even if it is actually true? The excellent cast and director Juliet Bowler are all in here, as emotionally invested an ensemble as I’ve seen in a while. The production values also have been a strong point of the troupe in recent works. The ending of “Fat Pig” may or may not satisfy you, but by then LaBute has already accomplished his goal just by asking the questions and provoking thought and discussion. How you react – and, perhaps – adjust your attitudes accordingly are far more important. The Flat Earth Theatre production of Neil LaBute’s “Fat Pig.” Directed by Juliet Bowler. At the Mosesian Center for the Arts, Watertown, through June 24. flatearththeatre.com.